I sometimes secretly wish I was one of those Martha Stewart-y types who are just good at life. Not so much because of matching napkin rings and handmade centerpieces, but the useful stuff, like herb gardens. It would be so great to just toss fresh herbs into my meals without spending money on an entire bunch, and then letting the surplus die a horrible death in the refrigerator. Unfortunately, though, I have an alarming inability to keep plants alive. I first discovered this when I bought a houseplant – after that died, I moved on to sturdier specimens, like cactuses. Now I have a dead cactus. I try not to think about what this trait might mean for any future children of mine. Luckily for me, mint is incredibly tenacious. It’s basically a weed, so I figure if I just stay away from it, it’ll grow. Now it’s overtaken a fair chunk of my backyard, and I have a continuous supply of mint for any of my baking needs. The first thing I’ve used it in is this ice cream, and it was really incredible. 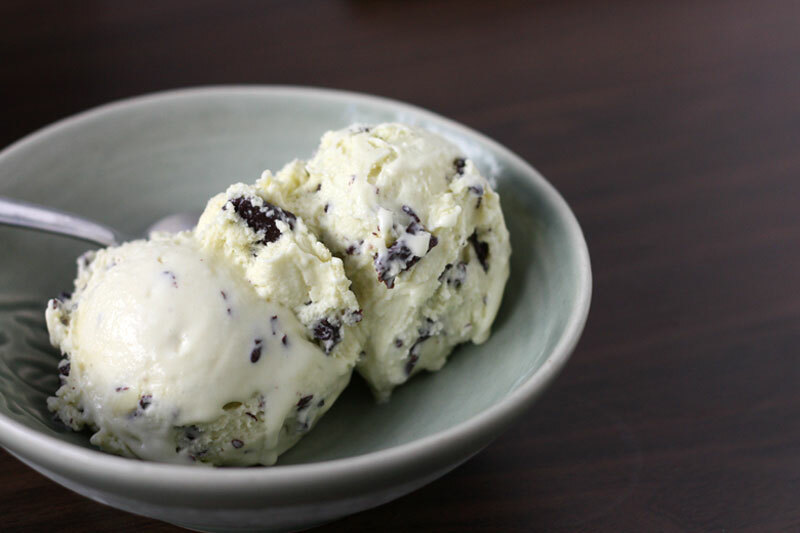 It’s very different from storebought mint ice cream – I think it tastes more herbal, both because the mint is fresh, and because it’s spearmint as opposed to the more common peppermint. I folded chocolate in, because I love it, and the crackling bittersweet shards were a great contrast. 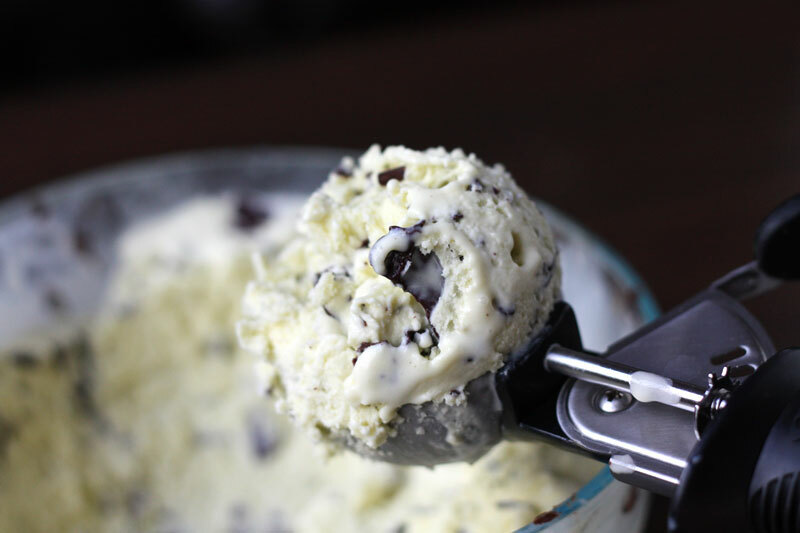 It’s really a spectacular ice cream and I recommend that you plant some mint just to make it. But if you lack my superior gardening skills, I’m sure the farmer’s market has some that will work just as well. 4 ounces bittersweet chocolate. chopped. In a medium saucepan, gently warm the milk, sugar, 1 cup of the cream, and the salt. Once warm, mix in the mint leaves, cover, and let stand for an hour to infuse the milk. Strain the mixture through a mesh strainer, pressing firmly on the leaves to extract as much of their flavour as possible. Rewarm the mixture. In a medium bowl, whisk together the egg yolks. Slowly pour the heated milk mixture into the eggs, whisking constantly to prevent the eggs from cooking. Return the mixture to the saucepan. Cook over medium heat, stirring constantly with a spatula, and scraping up the bottom of the pot. Cook until the mixture thickens and coats the back of the spatula – if you run your finger through the coating it should leave a line that doesn’t flow back together. Pour the custard through a strainer into the remaining 1 cup of cream. Stir until cool over an ice bath, then refrigerate until cold (preferably overnight). Put a storage container in the freezer. Freeze the custard an ice cream maker according to its instructions. While it’s churning, gently melt the chocolate over a double boiler or in the microwave. When the ice cream is ready, quickly layer it in the prepared container, drizzling in the melted chocolate and stirring as you go. The ice cream is wonderful freshly churned but still very soft, especially if you drizzle in the warm chocolate. It will firm up nicely in the freezer, but I recommend taking it out 5 minutes before you want to eat it to let it soften up again. MMMM! I love David’s book. Yeah, definitely have the same mint invasion problem in my yard… heh heh. Your ice cream looks absolutely divine! My herb garden is just about the only thing I’ve managed to NOT kill. And your ice cream would make it worth it to have mint overtaking my yard! Looks delicious! I totally laughed (in agreement) when I read about your mint growing like a weed! Mine is going nuts in a container on my porch, and I’ve been considering transplanting it to part of the flower bed. I’m worried that it will get a bit out of control if I do that, but at least it smells nice! After all of these wonderful recipes I’m seeing everywhere from “The Perfect Scoop” I’m thinking I need to invest in an ice cream maker. This sounds fantastic, and I have the same book! My co-worker recently told me that she has a ton of mint growing like weeds in her backyard too and she gave me some! Since I live in a mid-rise condo and would never be able to get fresh mint from any backyard, I was thrilled. Maybe I’ll try making ice cream too! 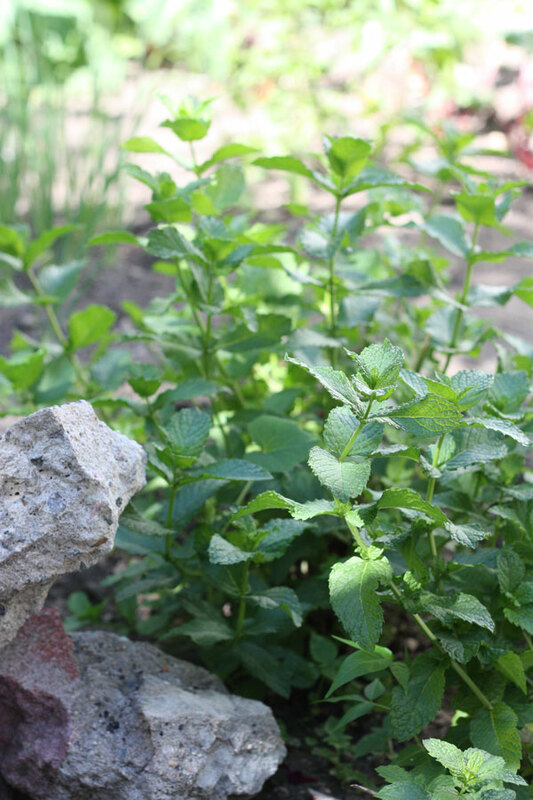 I’m pretty thrilled about the mint invasion too, I might even get up the courage to try gardening (!). I’m glad you’re all interested in making ice cream, it’s so delicious and makes me feel very accomplished! And the book I have, the Perfect Scoop, really is great. Mmmm I love mint ice cream!!!! This must be heavenly with the fresh mint!! Now all I need is an ice cream maker…. OMG….I haven’t had breakfast yet and I want Ice Cream……my wife would kill me….lol……she wouldn’t be shocked , just not happy! that looks so good…so creamy….so delicious! This ice cream looks absolutely amazing. Sometimes I wish I could be like Martha Stewart, but then I think of how stereotypical that would make me and get over it LOL!! Great photos you have here. Mmmmmmint. Deliciously prolific, it is. I’ve been drooling over The Perfect Scoop in the bookstore- I need it. Thanks for sharing this recipe from it! You are currently reading fresh mint ice cream at one cake two cake.